Blue Mountains & Nepean Christian Model Railway Fellowship (BM&NCMRF) is a group of people who share a love of the Lord Jesus Christ, plus an interest in trains in general, models in particular. Many of us are members of the Valley Heights Locomotive Depot Heritage Museum. 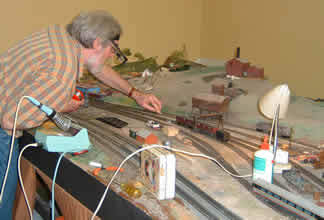 We meet at the museum several times each year and undertake maintenance on the museum layout. We have a club house called the Loco Shed in nearby Warrimoo with a variety of HO and N scale layouts. In addition we meet at homes of members. © Copyright 2005-2018 Blue Mountains & Nepean Christian Model Railway Fellowship, except where other copyright applies. Page Updated: Monday, 18-Jun-2018 17:59:46 PDT.